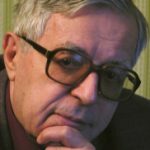 Lev Nikolayevich Naumov (Russian: Лев Никола́евич Нау́мов; February 12, 1925, Rostov – August 21, 2005, Moscow) was a Russian classical pianist, composer and educator. Received a title of People’s Artist of Russia and was nicknamed the “Godfather of the Russian piano school”. Professor Naumov studied with the legendary Heinrich Neuhaus, becoming his assistant and eventually his successor. Naumov was a professor of piano at the Moscow Tchaikovsky Conservatory and a jury member in many international competitions. Professor Naumov’s studio produced some of the better-known pianists to emerge from Russia in the past 40 years. Among his students at different times were such pianists as Alexei Lubimov, Alexei Nasedkin, Vassily Lobanov, Andrej Hoteev, Anna Malikova, Vladimir Viardo, Andrei Gavrilov, Andrey Diyev, Sergei Babayan, Lola Astanova, Alexei Sultanov, Vladimir Soultanov, Alexander Kobrin, Dong-Hyek Lim, Pavel Gintov, Alexander Tselyakov, Violetta Egorova, Nairi Grigorian and many others.